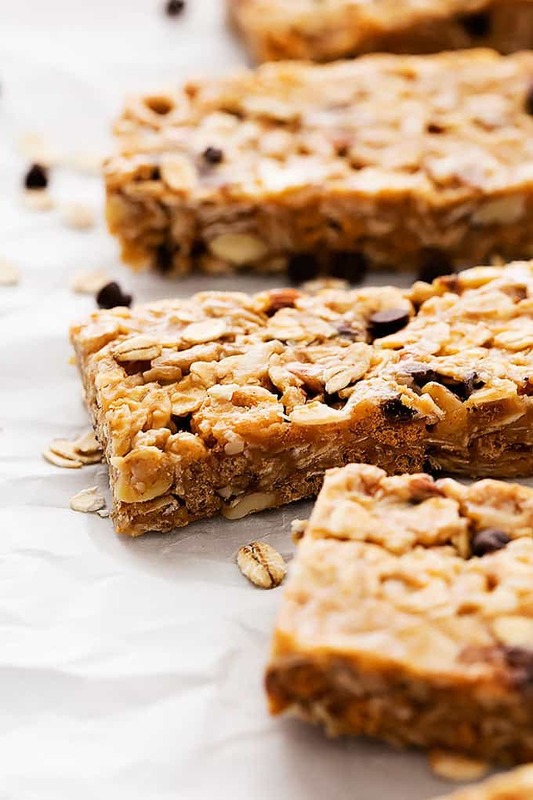 These easy, no bake chewy granola bars have a sweet and salty flavor, awesome texture, and are perfect for breakfast or snacks on-the-go. On a day to day basis, I just don’t have time to make elaborate breakfasts. Who does? Mornings are craziness at my house. Usually ten o’clock rolls around and my stomach is grumbling so loud it’s downright embarrassing and I grab something small and quick just to get it in my belly as fast as possible. Probably nine times out of ten it’s a granola bar. I love granola bars. They come in about nine million and seventy three varieties so I never get bored with them and they are just so darn easy to throw in my bag or pocket when I’m rushing out the door – and not just in the morning. 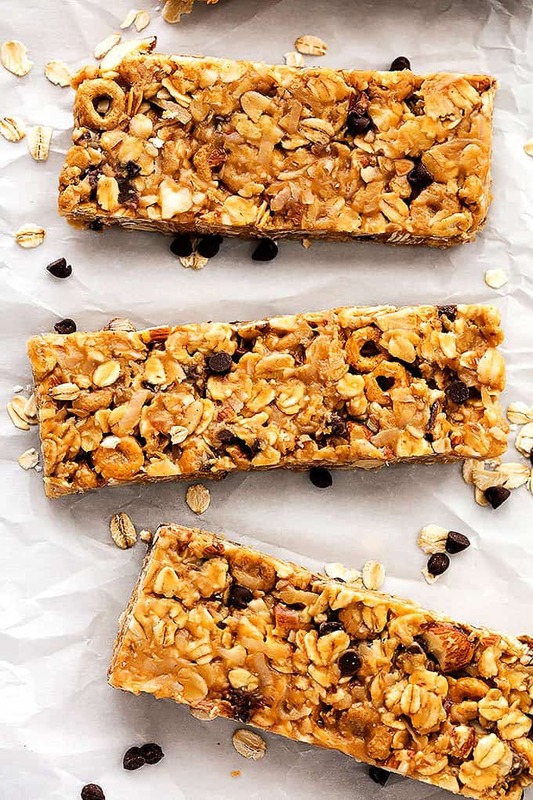 These chewy homemade granola bars are so so easy to make and have the best sweet and salty honey and peanut butter flavor. Plus a little hint of chocolate! Also, they’re loaded with rolled oats and some nuts to give you an extra protein boost and keep you full longer. And if that’s not awesome enough, you don’t even have to bake them! You just press the mixture into a pan and let it chill for a couple of hours til they firm up! Win win win win win all around. Easy no bake granola bars with honey and peanut butter flavor - easy to customize and quick to whip up! Combine cereal, coconut, oats, salt, and chopped nuts in a bowl and stir to combine. In a small sauce pan combine peanut butter and honey and stir over medium heat until smooth. Stir into your oats mixture. Stir in chocolate chips if using. Line an 8x8 inch pan with nonstick foil and lightly grease (I used cooking spray but you could also use butter or oil). Press granola mixture into your pan. Freeze for 20 minutes. Lift foil from the pan and place on a flat clean surface. Cut into bars. Store in airtight container together or individually wrapped in plastic wrap. Store chilled. 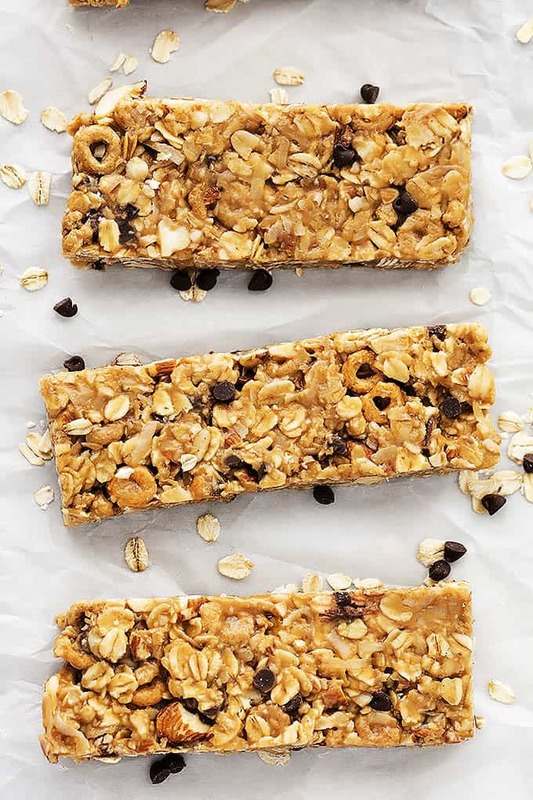 Try these other Granola Bar Recipes! These look good, and simple to make. One thing…in ingredients list after honey you have just a 3. I take it that is for 3 oz chocolate chips. Did a great job with video. Pinned. Yes, I was also wondering what was supposed to be there along with the “3”. Hopefully it’s just chocolate chips, and not another important ingredient. But in the instructions that was the only thing I didn’t see listed, so it’s most likely that. I love making granola bars at home, but haven’t lately. These look great, I’ll have to get back into it! Hi Sue, They should stick together when they are stored chilled. Did you try that?